Shopping for your little one, expenditure on nappies, wipes, and baby toiletries really adds up. To help you cut costs, we compared a basket of 13 essential baby products over seven stores to see where was the cheapest, and looked at the frequency of special offers on certain products. Tesco emerged as the most expensive place to grab your baby things like nappies, baby food, and nappy rash ointment. In a market where multibuys and reduced price deals are abundant, the supermarkets aren’t ranked in the order you might expect – Waitrose is not the most expensive place, and two stores are almost tied for the cheapest. Check out our full guide to baby essentials prices compared to see where was the cheapest place to shop, and what deals you should look out for. Our research found that it’s definitely worth shopping around for certain products: Johnson’s baby bath is on average £2.76 at Morrisons but £1.94 at Asda. One of the supermarkets we researched had the most deals on nappies, so it was best for that product even though it wasn’t the cheapest place to buy all your baby essentials overall. 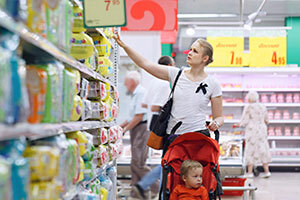 Considering that you can go through up to 70 nappies a week, shopping for nappies at this supermarket over the others could save you £18 over a two month period. Nappy wipes are another of the baby essentials that parents power through. Our research discovered had Pampers wipes on constant multibuy during our survey time period. If you’re looking to buy these in bulk, ASDA had a six packs for £5 deal 100% of the time that we looked at their prices; which puts the price per unit below the average of any other store. If you go through about three packs of nappy wipes a week, buying them on this offer at Asda will save you precious pounds. There are a few products that we would advise against paying full price for – if you’re looking for baby food, you can almost always find big brands on multibuy deals: try to avoid paying full price for these. Between 22 June and 23 August 2015 we compared the average price of a basket of 13 core baby products in different stores, to find out which one is the cheapest. We calculated the average price for each of the 13 individual products for a two month period in each of the eight stores. We used data from the independent grocery shopping website MySupermarket to do our calculations, and we included special offer discounts but not multibuy deals.